Sixty Six Allen, a development designed by Wallacebrice Architecture for Brisbane based developer Pikos is now on the market. The project is a collection of 23 three bedroom apartments starting from $785,000. The development is located at 66 Allen Street, Hamilton. Just a short walk to Portside Wharf and Eat Street markets, residents will be able to enjoy the riverside lifestyle. Nearby is Racecourse Road with supermarkets, cafes, restaurants and bars, offering a much sort after contemporary lifestyle. Connectivity to the city is also guaranteed with the nearby Bretts Wharf Ferry Terminal and Brisbane Bike Way. The project is well positioned for the avid traveler or frequent flyer, being a short 10 minutes from Brisbane International and Domestic Airport. Sixty Six Allen’s 23 three-bedroom apartments are located across three low-rise buildings. Each apartment has two bathrooms, walk-in wardrobes, European appliances, two car spaces and are 221 sqm in size. The development is appealing to buyers due to its proximity to Portside Wharf. Everything you need is at your doorstep, with the option of retreating to the privacy of a boutique building with just a handful of residents. These qualities make it an attractive alternative to high-rise apartment living. To capitalise on natural ventilation and lighting, the complex is broken into three buildings connected by central access elements. This allows for liner apartments, giving each bedroom natural light, and allowing for open plan living. Car parking is underground, adding storage cages to some apartments. The project will include landscaping to the common grounds and ground floor units’ private courtyards. 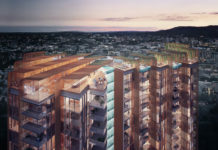 Sixty Six Allen is one of $400 million worth of projects for the Pikos Group, which also has developments in Kangaroo Point, New Farm, Ascot and West End. The floor plate layout of the development. For more information on this project, please use the enquiry form below.